You are here: Home » Willamette Valley Wah-hu? The deep fertile soil, long growing season and cool, wet climate of Oregon’s Willamette Valley are ideal for growing one of wine’s most finicky grapes. It’s no wonder that some of the world’s best, and most expensive, Pinot Noirs are grown here. It’s no wonder we set off to find, and more importantly sample, some. 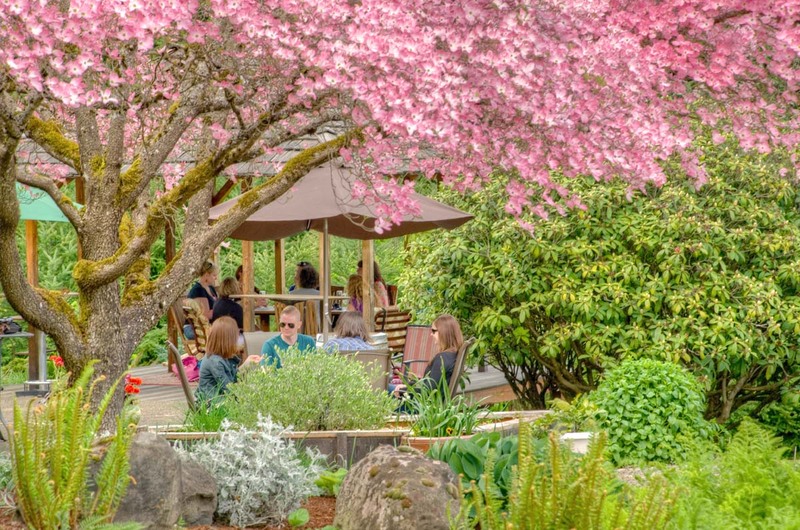 Stretching from Portland in the North to Eugene in the South, the valley not only includes a whopping 300 wineries but also most of Oregon’s population too. Its close proximity to major cities makes visiting Willamette wine country an easy day trip. Along the way, we discovered something totally unexpected. Back in our earlier, less frugal, days of wine exploration we found the finesse and subtleties of Pinot Noirs somewhat challenging. We’d spend big money on a Premier Cru Burgundy and often be left unsatisfied. It’s possible, even likely, that the big wines we were spending big money on needed to age. Or maybe our palettes are just not sophisticated enough for the good stuff. But I suspect that many of these wines were simply overhyped and over priced. We had so many mediocre Pinot experiences, up and down the price scale, that we gradually drifted away from the grape and toward more consistent varietals. These days big, fruity cabs and spicy zinfandels make up the bulk of our red wine consumption. But here in the Willamette Valley, the very heart of Pinot country, we were determined to find a wine worthy of all the hype we’d heard about but never really experienced. And boy did we. More than simply finding a good Pinot Noir, we found what might be the best wine we ever tasted. David Hill Vineyards’ BlackJack is produced from grapes harvested exclusively from some of the oldest vines in the Willamette Valley. It is then aged in both new and used French Oak barrels for 25 months, resulting in a wine with explosive black cherry fruit, soft tannins, and subtle vanilla overtones. Wow. At $55 per bottle this isn’t an everyday drinking wine, at least not for us. But with an upcoming birthday to celebrate we creaked open our wallet and splurged on a bottle. It paired beautifully with one of our favorite, and most indulgent, meals – veal marsala coupled with appetizers of pan-seared, prosciutto-wrapped dates and goat cheese. More than that, it stole the show. But finding great wine in the Willamette Valley wasn’t totally unexpected. Finding great sake was. As things turned out, we’re lucky we hit David Hill Vineyards early in the day because a sign reading “Sake Tasting Next Left” caught us by surprise and detoured us off our original wine tasting itinerary. Following signs deeper into the valley led us to Oregon’s only sake brewery. Soon after establishing Sake One as a Japanese rice wine importer, the owners discovered that the water from Oregon’s rainforest aquifer was ideal for making premium sake as well. In 1997 they completed their first kura (sake brewery) and bottled their first products under the Momokawa and Moonstone brand names the following year. Today, they’ve grown so large it’s difficult to turn around without seeing their sakes somewhere. Okay, that’s an exaggeration. Sake accounts for a vanishing small amount of U.S. alcohol consumption. You’ll be lucky to find three different bottles of the stuff at your local liquor store. But if you do, chances are good that one will be a Momokawa. And chances are if you grab that bottle, you’ll be glad you did. Better yet, head over to their tasting room in Forest Grove, Oregon, for a sampling of succulent sakes and an education, too. Before showing up we didn’t know, for example, that only inferior sakes are served warm (to mask imperfections) or even that they had such range in flavor and texture. With offerings ranging from crisp and delicate (Momokawa Silver) to big and bold with layered fruit (G Sake) we discovered sakes suitable for every occasion. In fact, if there’s a meal you currently enjoy with white wine, I’d wager there’s a sake for that. So move over Pinot Gris, at least a little, there’s a new white in town and one that we never expected to find here, in the very heart of Pinot country. We are MOVING to McMinnville, Oregon in a few weeks and my husband, the resident wino, is thrilled. LOL Thanks for the heads up on the sake!! This part of the world is indeed a good place for us “winos” Enjoy. We’re fans of Canadian brew too. Well, really any brew but that covers the Canadian stuff as well. We’ve enjoyed the Willamette Valley wines on many stops near Eugene for MH service. Then we found “Harvest Hosts”, a group of vineyards, sustainable farms, dairies, etc. that allow free overnight RV parking on their property. This led us to Emerson Vineyards, just south of Salem off Hwy 99. We parked in a beautiful setting, very photogenic, and of course visited the tasting room right away. As luck would have it, it was Friday night summer music festival. Great to know where to find Pinot grapes! I’m a Connecticut wino and Pinot grapes aren’t found here. Would love to travel to the Oregon coast and experience the difference in the wines!